Need a new go-to dinner recipe? 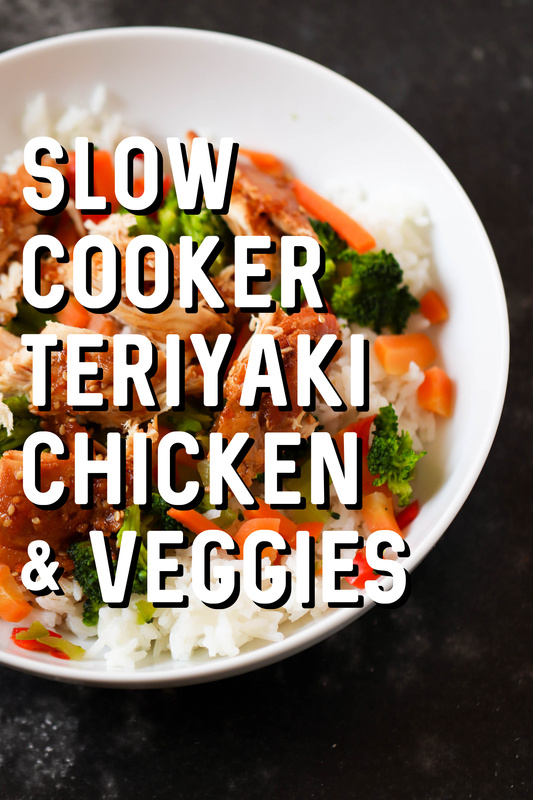 This Slow Cooker Chicken Teriyaki is SO simple - it takes just a few minutes to throw into the crock pot and it always tastes amazing! We LOVE our crockpots. No, love is an understatement. We don’t know how we would survive without them! 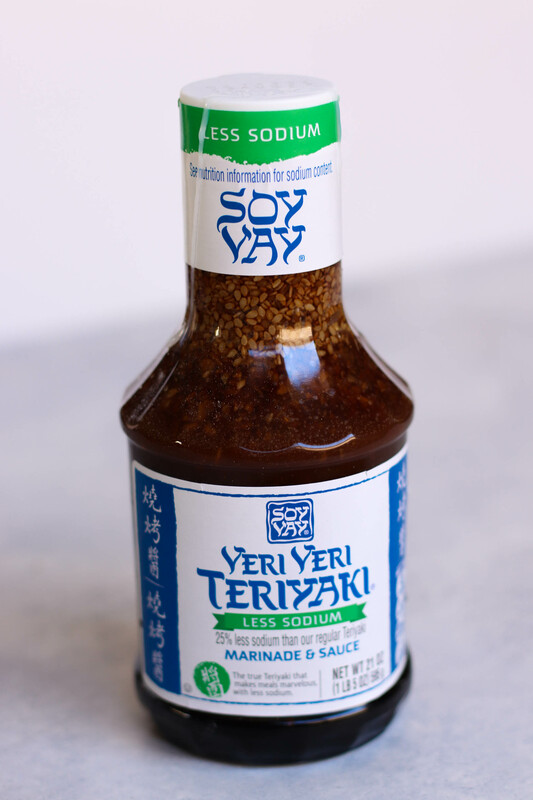 This isn’t sponsored, we just always love this teriyaki sauce (we use it for this recipe and this recipe, too). The less sodium tastes just as good as the full sodium, too. You can use any type of teriyaki sauce or marinade, too. Spray your crock pot with non-stick cooking spray or use a slow cooker liner. Place your chicken in the crock pot (if you need a new one, this slow cooker is our favorite). Pour the teriyaki sauce over all of your chicken (we usually use 1 to 1 1/2 cups). Cook for about 4 hours on high or 6 hours on low. You want to make sure it is cooked, but don’t over cook it or the chicken will be dry. If you use chicken that isn’t frozen, it may cook quicker by about an hour or so and you may want to check it to make sure it doesn’t overcook. About 10 minutes before you eat, stir-fry the veggies on your stove top (or even your microwave). You could also throw them in your crock pot for the last 15 minutes of cooking. We would not recommend throwing your veggies into the crock pot to cook with the chicken at the beginning, because they tend to get mushy. 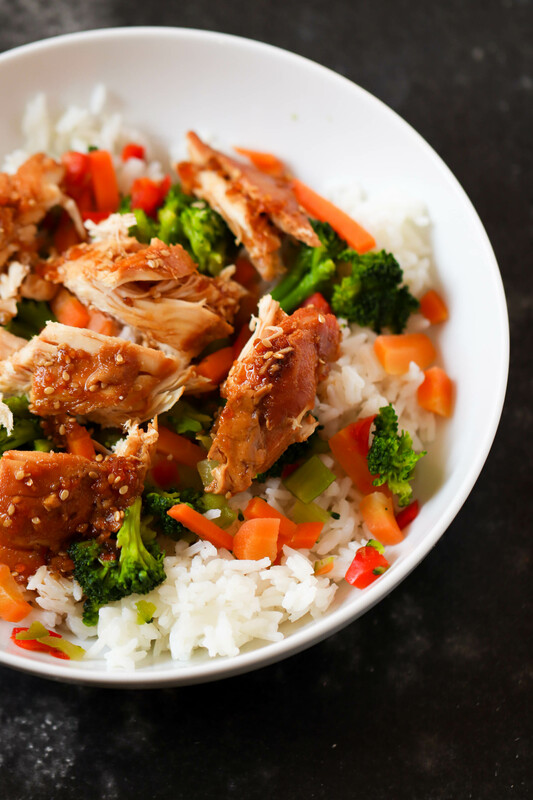 Place some rice in a bowl (don’t cook your rice in your crock pot – it will be too mushy) then place your veggies over top of the rice, and then top it with your chicken. The chicken should fall right apart from cooking (we don’t cube or chop it up before putting it in the slow cooker), and tastes great shredded. If you need extra sauce to put on top, you can scoop whatever is leftover in the crock pot or use the last of the sauce from the bottle. See how to make this easy meal into lunches for the whole week. Spray your crock pot with non-stick cooking spray. Place your chicken in the crock pot. Pour the teriyaki sauce all over it (I use about 1/2-3/4 of the bottle). Cook for about 4 hours on high or 6 hours on low (you want to make sure it is cooked, but don't over cook it or the chicken will be dry). About 10 minutes before you eat, stir-fry the veggies on your stove top (or even your microwave). I have thrown my veggies into the crock pot to cook with the chicken before, but I don't like it as much that way because they tend to get mushy. Place some rice in a bowl, put veggies on next, then throw your chicken on top. If you need extra sauce to put on top, you can use what is in the crock pot or what is leftover in your Teriyaki bottle. Do you ever use frozen chicken breasts? And if you do... do you throw them in the crock pot still frozen? I'm young and just learning about cooking lol. This is probably a stupid question! I usually always use frozen chicken breasts with no problem. I am just eating it and am so pleased! It's so yummi and easy to prepare! Thanks for this great recipe! 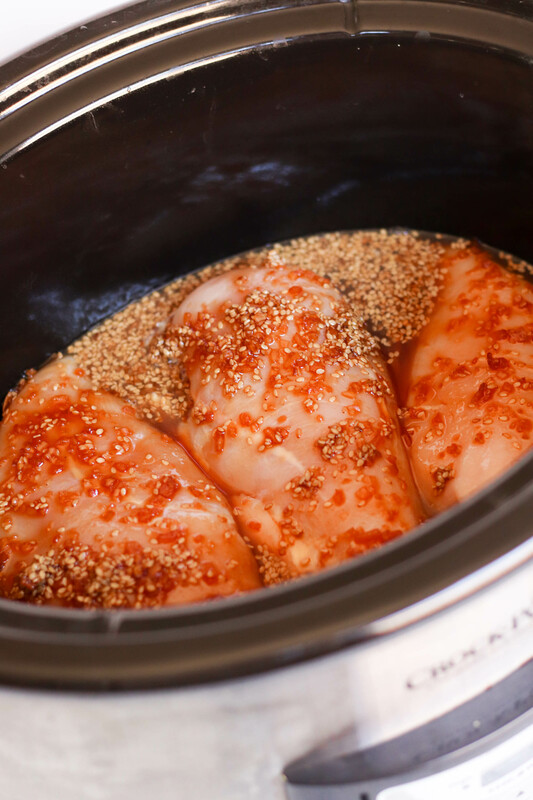 The only problem with frozen chicken breasts in the crock pot is that bacteria is more likely to grow than if the chicken is defrosted because of the low temperatures and the extra time it takes to cook it from frozen. It's not incredibly common just be aware that it can lead to food poisoning! Start it on high...sauce first, then chicken...get it hot then turn it down to medium after adding veggies.....cook, then turn down to low until dinnertime. I couldn't find a "sauce" but found a base/glaze, is this not going to work?? I have alwasy used frozen, but this time they are thawed! Is the timing the same for the thawed chicken breasts? Hi Megan, If your chicken is thawed it will not take as long to cook. Watch is closely. You may be able to cut an hour off of your cooking time. But be sure to make sure the chicken is done. Sounds delicious!! Do you cook the rice in the crockpot too? We did not put the rice in the crock pot. We cooked it separately and added the chicken and stir fry veggies on top. 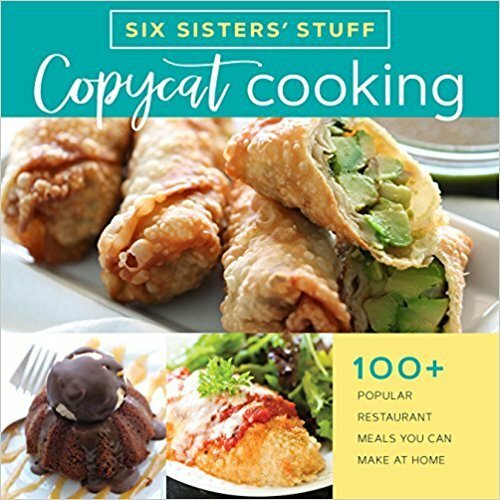 Excellent recipes. However, I do thaw my chicken, in the refrigerator the night before. Bacteria does grow quickly with poultry. Just Beware! Could you use the Kikkoman Teriyaki Marinade & Sauce? Or no? I only have marinade,will that work? Do you need to cut the chicken up or does it just break apart while cooking? I didn't see cubed chicken or a direction to cut up the chicken anywhere. We left the chicken into bigger pieces, we didn't cube it.